From as young an age as possible children should be shown by their parents the importance of a good daily dental routine. If a pattern of daily brushing and flossing is set in place early, then it will be an excellent preventative measure against oral infection and tooth decay. Dental care for children should also include building a good relationship with their dentist through regular visits. Dental care for children should start before primary teeth have even erupted. Almost all dental decay can be prevented and the parent’s role is vital in this area. Babies and toddlers should not be allowed to go to bed with bottles filled with sugary liquids, and if the primary teeth have not erupted yet, it is important to dab any excess liquid from the gums with soft gauze. Letting sugary liquids build up on the gums is an easy way for decay to begin. The first dental visit should be around the age of one year old and that is also the age that toothpaste should first be used. The primary teeth are very important to the future development of the permanent teeth and in the development of healthy muscles and the jaw bone. They should be given just as much care and attention as secondary teeth. Children need to be taught that the dentist is someone who will help look after their teeth, but only help, the groundwork needs to be laid by the child. The most important factor in good dental care for children is making sure children know the correct way to brush their teeth and the importance of flossing. If you can, try to get your child to brush after every meal, the longer food stays on the teeth the longer the acid can attack and the more chance plaque has to take hold. A quick brush with a toothbrush will not be enough; try putting your child’s favourite song on and telling them that they need to brush until the song is finished. For extra protection, get your child to use a fluoride rinse after brushing and flossing. The importance of good dental nutrition and the value of cutting down on sugary snacks should also be impressed on children. Gum disease does not just affect adults; gingivitis, which is the early stage of periodontal disease, can commonly be found in children. 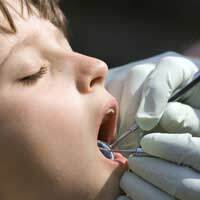 More serious periodontal diseases in children are rare but do occur. These infections are preventable, but if they are not caught early they will cause serious damage to the teeth, gums and jaw bone.If your child suffers from diabetes type 1, then he or she may be more susceptible to periodontal diseases. If your child is suffering from any of the above symptoms it could mean that they have some form of oral disease and a visit to the dentist should be made as soon as possible. Periodontal disease can progress into adolescence unless a daily dental regime is adhered to. In the rough and tumble children’s world it is not uncommon for a child to lose a primary tooth before it is naturally ready to come out. The primary teeth are the space holders for the secondary teeth and losing a tooth, or teeth, too early may mean problems with other teeth shifting into the empty space. This can lead to a lack of space for the permanent teeth, and crowding of the permanent teeth may occur. If this happens then some form of orthodontic treatment may be required, such as braces to address the problem. Dentists can use space maintainers in order to hold the space that has occurred from loss of primary teeth, and the maintainer will be kept there until the permanent tooth grows into place. Space maintainers are a simple preventative measure that will save further treatment by an orthodontist in the future. If your child plays a lot of sport, make sure they always wear a mouth guard to protect their teeth. How parents interact with their children when it comes to learning the facts of dental health will be a factor in the child’s continuing dental care. Parents should realise that they are the ones who will be setting the example to the child from an early age, and it is all too easy for the child to forget about daily brushing and flossing routine come bedtime. Making the dental routine fun for a child will make cleaning of the teeth less of a chore and something to look forward to, and will also be remembered well into later life. Is Dental Insurance Cost Effective? Getting your child into a good oral health routine at a young age will ensure they continue to have good oral health when they are older. Speak to your dentist if you have any concerns about the development of your child's teeth or their general oral health. Childhood years is one of the crucial stage as habits are formed here, that is why it is encouraged to teach them the right and proper habits like having a good dental hygiene. Teaching them how to do it as well why they do it is very important. Love your article, very helpful and informative especially to mothers like me. Keep on writing, looking forward to read more of your impressive articles.